Nigerians queue to buy fuel during one of the frequent shortages. Protestors say it is unacceptable in an oil-producing country. Nigerians are among the most active Internet users in the continent. (CNN) -- Thousands of Nigerian youths took to the streets Tuesday in a rare display of public anger over issues ranging from infrastructure failings, fuel shortages and power blackouts that reflect growing pressure on the country's ailing president. In a largely peaceful four-hour protest, they marched to the National Assembly in Abuja, Nigeria's capital, carrying placards and wearing T-shirts saying "Enough is Enough," and carrying a letter outlining their demands. Organizers told CNN they were met with heavy police presence and were prevented access to the Assembly to deliver their letter. Chude Jideonwo of the Future Nigeria Group said: "The police barricaded the first gate to the Assembly, so we staged a sit-in and all of us, including some prominent Nigerians, sat on the floor before forcing our way into the assembly gates. There were around 2000 people." Nigerians, who in 2003 were voted the happiest people on Earth, rarely take to the streets in protest, despite the myriad problems the country faces. Among their demands are calls for ailing President Umaru Yar'Adua to resign or be removed from power to end a long-standing power vacuum. He left the country in November for treatment in Saudi Arabia and since his return last month, has not been seen in public. They also voiced concerns about a lack of security in the country, which frequently sees armed robbery attacks and in recent weeks, religious massacres in the north of the country, carried out by machete-wielding militias who killed hundreds of people. Organizers of the protest, the Future Nigeria Group, say they are also demanding the 6,000 watts of power that the Nigerian government promised to provide by the end of December 2009. Many Nigerians rarely have constant power and are forced to buy generators. According to one United Nations estimate, 70 percent of Nigerians live on less than a dollar a day. Those who can't afford generators simply live in darkness. Let history record that this was the day Nigerian youth came together to take charge of their country." As an unnamed commenter put it on the whereisyaradua site: "Can you imagine surgery under torchlight?" Among those who supported Tuesday's rally is Nigerian brand consultant Subomi Plumptre. In a video message posted on the site, she said: "I'm tired of a Nigeria where there's no fuel, where there's no light, where there's no water and where's there's crappy education." Protesters say another gripe that brought them out onto the streets is the chronic fuel shortage in the country. 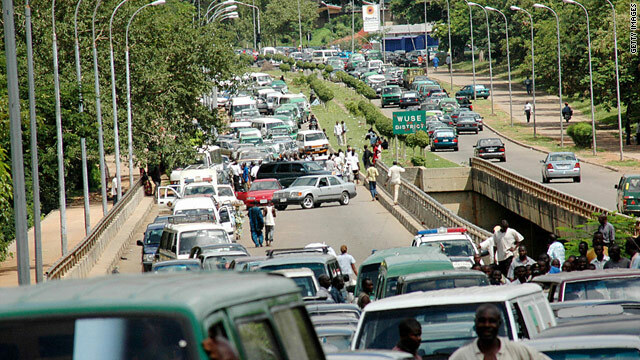 Despite being the sixth largest oil producer in the world, Nigeria has, for the past few months, been in the grip of a massive fuel shortage causing citizens to line up, sometimes for hours, to buy gasoline. "The youth and middle classes have been silent for years in Nigeria and now people are getting angry and saying: 'Hello, what are you doing with our country?'" Jideonwo said. "Nigerian youth are surviving in spite of the government, but at some point you have to move away from community organizing, as Obama teaches us, to influence governmental decisions," he added. The "Enough is Enough" rally has largely gained momentum via a well-orchestrated social media campaign, organizers said. Sites like Facebook, Twitter and blogs popular among Nigerians were key to mobilizing people to get involved, said Jideonwo. They also set up a Web site and used it to drive awareness for the campaign and connect with young people. "Without social media, we would have been unable to reach the numbers we have so far ... a key part of our strategy was to move people's anger off the blogosphere and onto the streets," Jideonwo said. Nigerians are among the most active Internet users in the continent, according to Web site internetworldstats.com. Sixteen percent of the country's estimated population of 150 million are active online and usage has grown over 5,000 percent since 2000, according to figures from 2009. Egypt has the highest usage for Africa, with 18 percent of its population online. "We've not really explored the capacity for tech in Nigeria, but we find a way to do what we need to do," Jideonwo said. "But that's the Nigerian spirit. "Despite the fact Internet is slow, schools don't have Internet and people don't have the purchasing power to buy access as much as they would like to, young people find a way to get connected," he said. "This was an an anti-system rally," Jideonwo said. "We're anti a system that would even condone a man who is absent from his duty for three months." "We, the youth of Nigeria demand that President Yar'Adua should resume or resign," he added. Jideonwo says he firmly believes in the collective power of Nigeria's youth to effect change because of the sheer numbers of young people in the country. Seventy percent of Nigerians are under 35, according to the CIA World Factbook Web site. "This [protest] was a defining moment," Jideonwo said. "Something has definitely shifted among young Nigerians, people have been waiting for a long time for someone to lead them. "We've tasted how delicious democracy is and Nigerians have finally begun to flex their democratic muscles," he added. "Let history record that this was the day Nigerian youth came together to take charge of their country."